Our Five Days of Play Dough Sensory Play begins on 7th April 2019. I’ll be sharing a week plan of wonderful play dough sensory play ideas along with free printables. 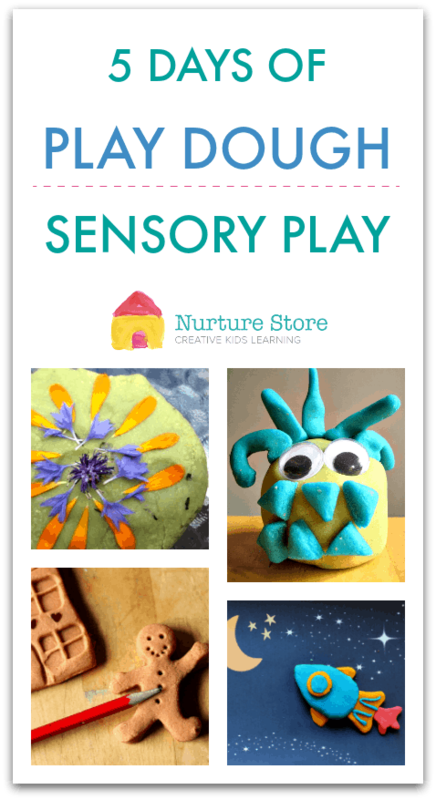 NurtureStore hosts regular themed weeks of sensory play, giving you ideas, activities, and printables all year round. Join in! We’re starting on April 7th and I’ll be emailing out details and play ideas all through the Play Dough Week. You might like to pick just one of these ideas to enjoy or offer all five over the course of your week. It’s such an advantage to give children a range of sensory play and to work on a theme and play dough is an amazing sensory play material. It boosts fine motor skills, math and language, and imagination. Coming back to a theme over consecutive days gives time and space for ideas to brew, and the repetition helps children find depth and meaning. Day One :: a new flavour challenge! For day one of our play dough week, take the New Flavour Challenge! Let’s start our play dough week by trying a play dough version that we’ve never tried before. One of the delights of play dough is how versatile it is: you can make it any colour or with any scent you like. Each variation is a brand new invitation to play. Over the years my children and I have made so many different flavours, just using things we have on hand in the kitchen. The measuring, mixing, and kneading involved in making a new batch is a great math lesson and fine motor skills, so do get your children involved in making your chosen flavour. You can use store-bought play dough and jazz it up with scent, but homemade play dough is so super easy to make that if you’ve never tried your own, this is the week to do it. Use my easy no-cook playdough recipe. And what flavour will you add? Apple, chocolate, lavender, lemon, herb, jello, gingerbread….take your pick from my list of homemade play recipes or invent your own. We really want to see what you choose, so do share a photo with us on social media! For day two of our play dough week, let’s use it as an invitation for role play. When children are role playing, they get to try out and perfect skills that they’ll need in the real world. They are able to practice conversations and put new vocabulary to work. They can try team work and problem solving, and practice practical skills like serving food, answering a telephone, and taking messages. All this is done in the safe space of play time, so they have the benefit of building confidence and skills while having fun. Play dough lends itself so well to role play. Let’s use it today to set up a role play situation for our children to use. Maybe your children have an idea themselves of what they’d like to role play, or maybe you know of a situation where they could do with some practice. 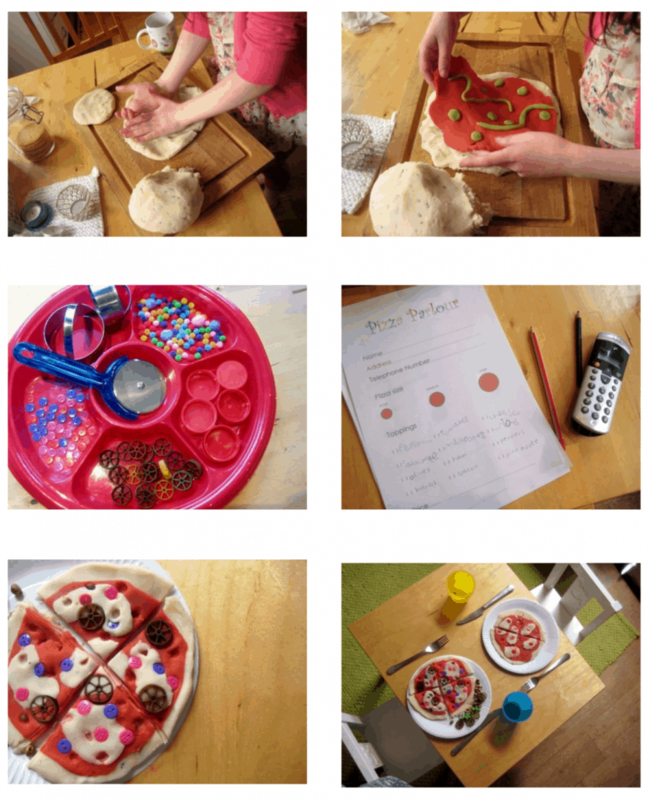 To get you thinking about the elements you could include, take a look at our play dough pizza parlour and our play dough bakery. What play dough role play will you create today? Let us know! Another great way to use play dough for imaginary play is to use it to create a small world. A ‘small world‘ is little play scene, created using toys, sensory materials, and other loose parts. I’m sure your children will set up small worlds naturally using their toys, and you can also set out a selection of curated materials to invite them to create a small world based on a theme or a topic you’re learning about. Play dough is an excellent ingredient in a small world because it’s so versatile – children can use it to make anything they can imagine! So for day three of our play dough week, let’s help our children create their own play dough small world. You might try a play dough jungle or an under the sea world (with printable ocean animal cards). You could re-tell a favourite story such as the gingerbread man, or create an imaginary play land. Set out a few materials with your play dough, or use one of our printable play dough mats and invite your children to create their own small world. Do you share your idea with us, we would love to see what you dream up! :: set out play dough with pencils and invite your children to make marks and write in the dough. 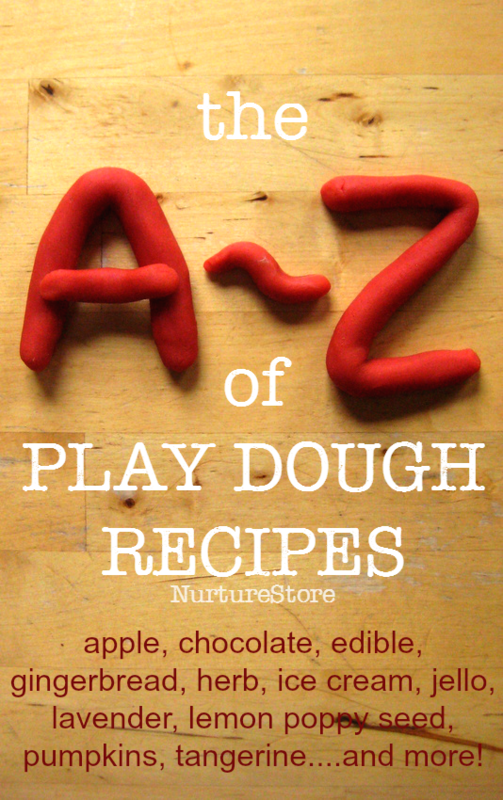 :: use dried pasta, shells, buttons, blocks or leaves to make prints in play dough. What patterns can you create? :: did you know you can draw on play dough? Roll out playdough to make a flat surface and use marker pens to create designs. When you’ve finished just knead the dough to incorporate the pen into it, to add a little extra colour. 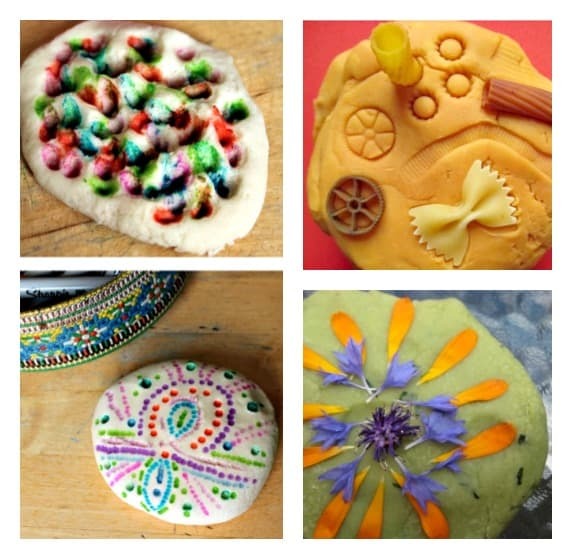 Give play dough art a try today! On the final day of our play dough week, invite your children to take the Play Dough Construction Challenge! You can use my printable Creative Building Challenge Cards. Print them out and set them out with your playdough. 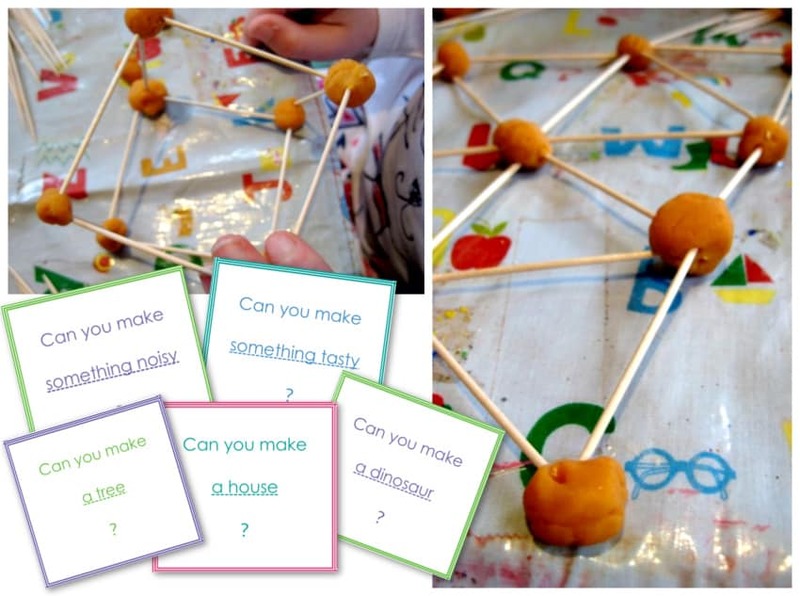 You might offer some loose parts alongside, which your children can use to build with: tooth picks, drinking straws, lollipop sticks, dried spaghetti, and pipe cleaners are all good options. The challenge is to pick a card and see if you can build whatever it suggests. Your children could work alone or in pairs. They might like to have a competition and vote on the best build, or might prefer for everyone to have the chance to show-and-tell what they make. The printable Creative Building Challenge Cards will give you lots of prompts for what you might build. Share what you create with us! Thank you for joining in with our Five Days of Play Dough Sensory Play. Thank you for giving your children the wonderful experience of sensory play and the richness of exploring a themed week. And thank you for sharing your photos with us and being part of the NurtureStore community. Coming up in May: mark your planners for the week May 12th 2019….it’s going to be Nature Week! I’ll have some super ideas to share with you. If you’re not already a NurtureStore subscriber, add your email address to the box below so you receive all the details, ideas and freebies.